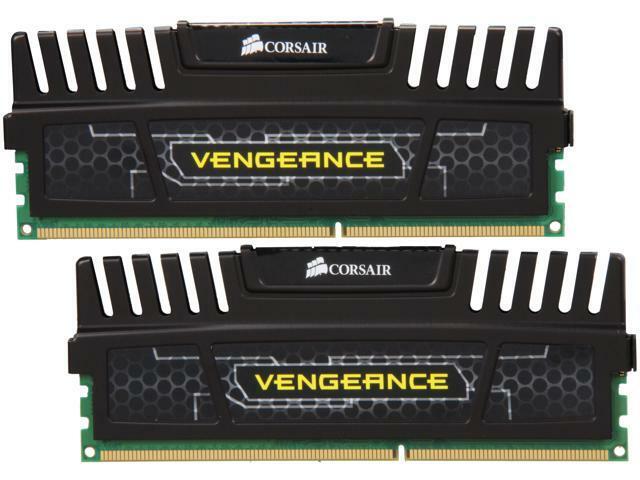 Designed with overclockers in mind, Corsair Vengeance DDR3 memory modules use carefully selected RAMs to enable excellent overclocking results on current and future generation Intel and AMD platforms. All initial Vengeance memory modules have a low 1.5V supply voltage for maximum compatibility and energy efficiency. Aluminum heat spreaders help dissipate heat effectively while providing an aggressive appearance for your gaming rig. As a bonus, the attractive low price of Vengeance memory will also leave lots of room in your system build budget. This Corsair Vengeance 2 x 2GB memory kit (CMZ4GX3M2A1600C8) populates your dual channel system with a massive 4GB of system memory for amazing multitasking performance. Engineered to run at 1600MHz at lower latency of 8-8-8-24 and 1.5V. 4GB Dual Channel DDR3 1600 CL8 Memory Kit This Corsair Vengeance 2 x 2GB memory kit (CMZ4GX3M2A1600C8) populates your dual channel system with a massive 4GB of system memory for amazing multitasking performance. Engineered to run at 1600MHz at lower latency of 8-8-8-24 and 1.5V. Great Overclocking Performance Corsair Vengeance DIMMs are built using RAM specially selected for their high-performance potential. Aluminum heat spreaders help dissipate heat to ensure stable performance. Optimized for Compatibility with the Latest CPUs and Motherboards Designed specifically for the latest CPUs, Corsair Vengeance modules run at 1.5V for maximum compatibility with all Intel Core i3, i5 and i7 processors, as well as the 2nd generation (Sandy Bridge) Intel Core processor family. Support for Intel XMP Intel Extreme Memory Profiles (XMP) technology provides a robust, profile-based overclocking solution for novice and experienced overclockers - easily overclock your platform by selecting the predefined profile in the BIOS, or manually adjust frequency and timings to extract maximum performance from your system. Comments: I will play with the timings to see if I can get the timings tighter like 7-7-7-20 at least that is my goal. Comments: I currently hungry, but don't want to get up.